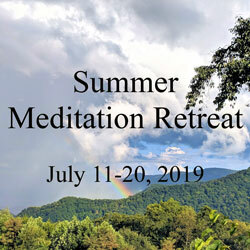 Learn more about Meditation Retreats at Mount Soma. Learn about the Advanced Techniques Course. If you have any problems with online registration, please call the office at 828.531.9946. All course participants will need to lodge at Mount Soma and stay onsite for the entire retreat. Price includes all meals, all meditations, and 8 nights lodging (nights of July 10 – July 19). Please note: The Summer Retreat starts at 7:30 am with breakfast on Thursday, July 11 and ends with dinner on Saturday, July 20. If you would like to stay longer and meditate with the Mount Soma Ashram, there will be additional charges payable upon departure. The early registration discount of $100 ends on May 11, 2019 (midnight EDT). A late fee of $108 will be applied starting July 3, 2019. All Student Union Lodging has shared bathrooms. Be sure to read Before You Come to Retreat and the Refund/Cancellation Policy. With the Classic Option, no work/activity shifts are required. Participants do all meditation rounds (4-6 per day), attend all lectures, and have the option of attending temple ceremonies. They are NOT required to do activity shifts such as food preparation, cooking and cleaning. Student Union lodging options include Basic (shared room), Semi-private (2 people per room), and Private (first-come, first-served). The Economy Option is discounted $300 from the Classic price. Economy participants do all meditation rounds, are able to attend all lectures and temple ceremonies, and have 1 activity shift per day, such as food preparation, cooking and cleaning. Student Union lodging options include Basic (shared room), Semi-private (2 people per room), and Private (first-come, first-served). If you have lodging questions, please email reservations@mountsoma.org or call (828) 627-6200. Retreat participants have the option of attending temple ceremonies. The meditation schedule will accommodate all scheduled Pujas and Havans.